Updated Surface Book i7 gets fatter GPU, slightly fatter body, and keeps the Fulcrum hinge. Microsoft’s new Surface Book i7 will have longer battery life and more than twice the graphics performance of the previous model. The overall design cues don’t change. The screen is fully detachable and reversible and can function as a tablet, while the base contains the graphics chip and extra batteries. Pen and touch are supported, of course. And that unique Fulcrum hinge, which was rumored to be on the chopping block, remains. The biggest upgrade is, of course, the GPU. The original Surface Book used a “GeForce” GPU with no actual model number attached to it. Most chip experts believed it to basically be a GeForce GT 940. This time at the rodeo, Microsoft updates the GPU to a GeForce GTX 965M with 2GB of GDDR5. That’s quite a step up in performance—a level I haven’t seen in anything smaller than a 15-inch laptop—but it’s still likely to disappoint some. That’s because while the GTX 965M isn’t a bad GPU, it’s a little elderly and built on the old 28nm process. Nvidia just announced its desktop GeForce GTX 1050 and 1050 Ti, which will likely be far more powerful and power efficient. The problem here is that Nvidia hasn’t released the laptop versions yet. There’s a GeForce GTX 965M mobile chip inside the new Surface Book i7. No matter the part though, doubling the graphics performance of the old Surface Book is an admirable feat. In fact, Panay said the company had to add an additional fan to the Surface Book base to keep it cool. The fan uses a hyperbolic fin design, which blows hot air out the back of the laptop. Although Panay said it was the same design, images of the new Surface Book seem to indicate it’s gotten a little bigger. Here’s a view of the old Surface Book next to the Surface Book i7, where you can see the hump on the keyboard to be, well, humpier. The newer Surface Book i7 seems to have a larger hump to accommodate the additional cooling for the more powerful GPU. Can’t see it? Here’s a better angle where you see part of the fan vent and larger hump on the more powerful Surface Book i7. You can see the hump better here on the right side just behind the hinge. The original Surface Book doesn’t rise up that much. What will surely disappoint some fans is the port selection. From what I can tell, the Surface Book i7 sports the same ports as the original, with a Mini DisplayPort, Surface magnetic charging connector, and analog audio on the right side. The left side sports two USB Type A ports and an SD card reader. In other words: no Thunderbolt 3 and no USB Type C support. You know all the smack-talking PC fans have done toward Apple because the company never, ever, upgrades its CPUs in a timely matter? Like how the MacBook Pro 15 you buy today is still using a 4th-gen Haswell-based CPU? Well, prepare for some payback because Microsoft just pulled an Apple with the Surface Book. While it has heavily updated the Surface base with a fat new GPU, it appears to have left the tablet portion of the Surface Book untouched—on the outside and inside. Rather than featuring the newest 7th-gen Intel Kaby Lake CPU, the Surface Book i7 offers the 6th-gen Skylake CPU. Sure, you say, Skylake to Kaby Lake is just a 10 percent performance bump (see my review of Kaby Lake for details), but who wants to buy a new laptop with last year’s technology? The other update Microsoft made with the Surface Book i7 was to increase battery life to “15 hours” of use using the old trick of just shoving in more batteries. Microsoft said it was able to get up to 30 percent more battery capacity into the Surface Book i7. As the original had an 18 watt-hour gas tank in the tablet portion and 51 watt-hour in the base, the newer Surface Book i7 will likely feature an immense 90 watt-hour battery inside. That’s close to hitting the maximum battery allowed in a laptop on a plane: 99 watt hours. Battery life should be stellar with a tank that size. Of course, between the added cooling for the faster GPU and the added batteries, you can expect more weight. A Surface Book i7 with the new “Performance Base” will come in at 3.68 pounds. 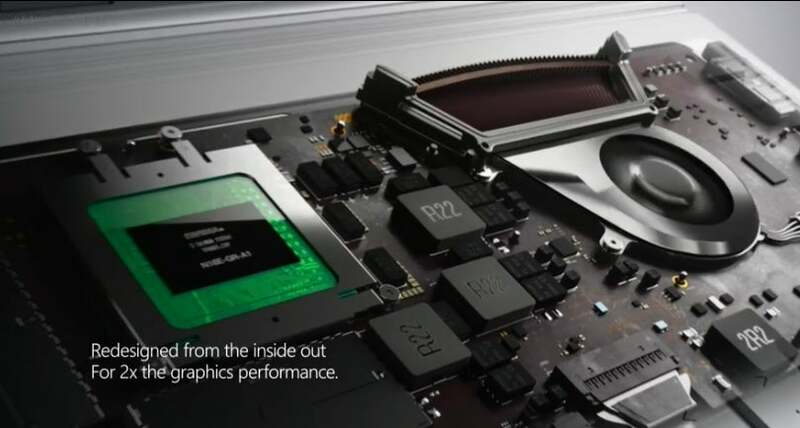 The previous Surface Book with a discrete GPU weighs 3.48 pounds. What’s really interesting with the new Surface Book i7 is how Microsoft upgraded it. From what I can tell, Microsoft basically kept the tablet portion the same and instead worked on a new base to pair with it. It also explains why there’s no Thunderbolt 3 or USB-C either—the controller chips for those would be contained in the tablet. In some ways, that’s a nifty strategy. In a laptop with discrete graphics, you can arguably say that Skylake to Kaby Lake isn’t worth the redesign, so instead you just redesign the bottom half and push it out the door. I also suspect that if you took the last-gen Surface Book, detached the tablet and swapped it onto the new Performance Base, it would work just fine. When we get the new Surface Book i7 for review, I’ll try it. The bad news for Surface Book users is that Microsoft’s policy has been not to sell replacement bases. You have to buy the whole thing. The new Surface Book i7 is available for pre-order at $2,400 with a Core i7, GTX 965M, 256GB SSD, and 8GB of RAM, and will ship on November 10. Panay went on to take a shot at Apple, saying the new Surface Book i7 is up to three-times as fast as a comparably priced MacBook Pro. I know it’s unverified, but I believe it. Last year I did a showdown between a MacBook Pro 13 and the original Surface Book, which I configured to equal the MBP’s price, and the Surface Book wasn’t just twice as fast in graphics tasks, but three times as fast. That’s no surprise though, as the MacBook Pro 13 packs integrated graphics. Sure, it’s Intel’s best integrated graphics, but a discrete GPU will stomp it good. The GeForce GTX 965M will triple-stomp it. The problem is, Apple is about to finally unveil new MacBooks. I’ll be shocked if the new MacBook Pro 13 comes out with a Skylake dual-core instead of a Kaby Lake dual-core. Apple will also have access to AMD’s latest-generation mobile Polaris chip. Most expect Apple to reserve that discrete chip for just the far larger and heavier MacBook Pro 15, but what if it’s able to stuff that 14nm-based Polaris into the MacBook Pro 13? If Apple does that, then we’ll have a different ball game and Surface Book i7 may not be the laptop kicking others’ butts.